Providing you with an overview of the core G Suite Applications and how they work seamlessly with each other. Using Google Classroom as the foundations, this session you will get the opportunity to use Drive, Docs, Sheets, Slides, Google Forms and other classroom tools like Calendar. The session is interactive allowing you to share, collaborate and comment. We will explain how to register for the exam and show you some final Q&A test questions to ensure you are all set. Please note: Attending this course does not guarantee a pass in the exam. Exams are taken independently after the course. Successfully integrating technology into the classroom doesn’t just happen – it takes careful planning and preparation. Knowing why it’s important and what tools are available are solid first steps. 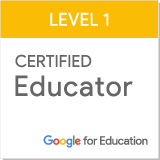 Google Certified Educator Level 1 Qualification is the perfect training for you. Split into three sessions over one day you will be given the skills to take the Educator Level 1 certification exam in your own time.